WHERE: On Broderick between Fell and Oak opposite Peet's coffee. WHAT: Pick up new fliers with the Reward Offering. Receive a location assignment for posting of fliers. We would like to express our gratitude for all the tremendous support that we have received from you. So many of you have brought us food, donated money, spent hours posting fliers and helped in any way possible. This outpouring of love and kindness has kept us going in the absence of our beautiful son Sean. We have yet to receive a single clue of Sean's location. As many of you know, we have placed fliers all over San Francisco, Marin, and some in the East Bay. We have sent search parties from San Francisco all the way to the Oregon border. Last weekend, Claude (Sean's dad) and two friends flew up to Montana to the Rainbow Gathering. This was a gathering of as many as 10,000 hippies and transient individuals. Some of the Rainbow family were in the park when Sean disappeared and it was speculated that he might be at this gathering. Unfortunately, Sean was not at the event, however, Claude and his friends managed to spread the word and hand out hundreds of photos and fliers. At this point it is time to bring the search to the next level. We are now offering a $5,000 reward for information leading to Sean's safe return. We are hoping this will stimulate further interest and some possible solid leads. As a result, we need your help to post these new fliers and help spread this information. If you are able to help us out, please join us this Sunday, July 14th. We will have 6,000 freshly printed fliers available to distribute. There are specific neighborhoods/locations that we would like to be certain to cover, however, if you prefer you have the option of placing the fliers in your own neighborhood. Be sure to bring a staple gun or tape (or both). 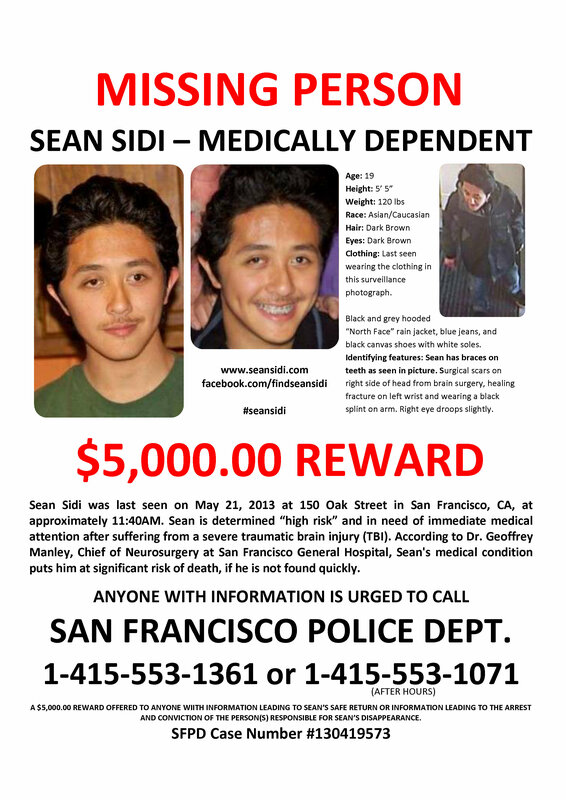 The family of Sean Sidi, missing from San Francisco since May 21, 2013 has just announced they are offering a $5000.00 reward for information leading to Sean's safe return. It is hoped that the reward will be the incentive that someone needs to provide information about Sean Sidi's whereabouts. The family has released a new missing person flier that includes the $5,000.00 reward and phone number for the San Francisco Police Department. 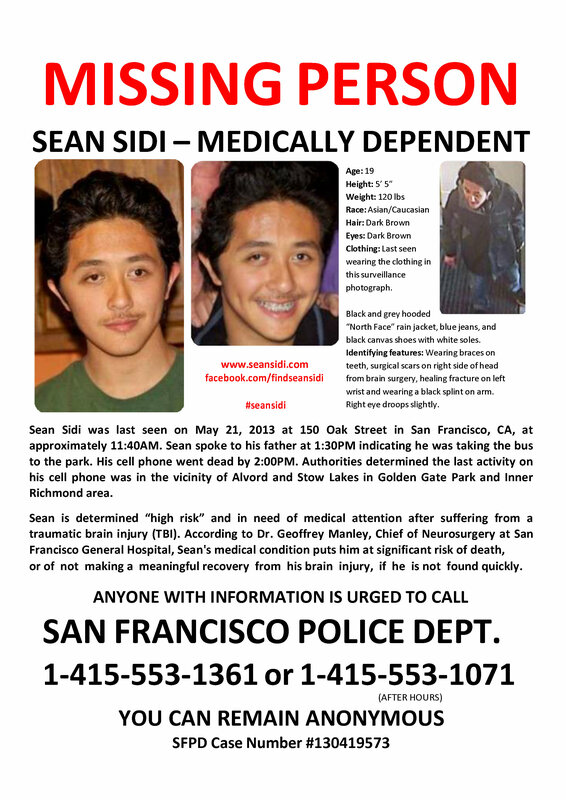 The Sidi family desperately needs the help of volunteers to distribute and share Sean’s flier in all sections of San Francisco , the Bay Area, and nationwide. It is hoped that at least 3,000 fliers will be posted and distributed in San Francisco - alone - within the next several days. The Reward flier can be downloaded and printed at http://www.seansidi.com/page/Missing-Flier.aspx, or obtained free of charge by contacting lynnkching@yahoo.com with your mailing address. Our search for Sean continues with unabated urgency. While all of you work tirelessly to distribute and repost Sean’s missing person flier, city workers in and out of San Francisco, continue to remove them! We try to not let this discourage us as we move forward in our search for Sean. The BIG QUESTION which remains to be answered (hopefully) this week is whether San Francisco Police will provide their ‘authorization’ for the ‘National Center for Exploited and Missing Children’ (“NCMEC”) to assist in the search for Sean. As posted earlier, NCMEC is the largest non-profit organization in the world assisting missing children throughout the country. It is blessed with a congressional mandate and $30 million in federal funding. On Friday, June 28, 2013, Sean was registered with NCMEC under ‘Suzanne's Law’, thanks to the assistance of Robert G. Lowery Jr., Senior Executive Director of the Missing Children Division. ‘Suzanne’s Law’ codified at 42 U.S.C. § 5779(a) allows NCMEC to provide additional resources to missing persons ages 18-21, to include investigative assistance, case analysis, profiling case information on the website at www.missingkids.com, and much more. However, before NCMEC can begin to assist in the search for Sean, San Francisco Police must provide their ‘authorization’. On Monday, July 1, 2013, NCMEC contacted Captain Jason Fox of the San Francisco Police, to obtain authorization for NCMEC to provide assistance in the search for Sean. We are currently awaiting Captain Fox’s response. There isn't a minute that goes by that I don't miss you with all my heart and soul. 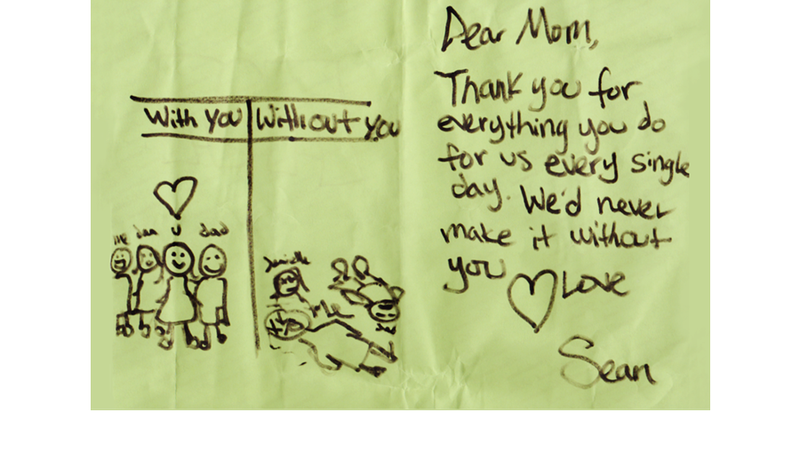 I smile and cry when I read the Mother's Day card that you made for me - just weeks ago. Your sense of humor, your sweet and thoughtful nature, your ability to convey a message - in a simple drawing, are all embodied in your card. You are special, Sean. There is no other like you. Dad and I know - without a doubt, that you need our help to return home. We will not rest until we are reunited with you, and our family is together once again. NCMEC has incredible resources and a Congressional mandate. We believe NCMEC will become a huge force in the search for Sean. The family was contacted by the team leader on SAT at 6 am! They do not stop working. The family and friends of Sean Sidi, would like to extend thanks to the National Center for Missing & Exploited Children (NCMEC). NCMEC is the largest nonprofit in the world providing assistance to missing children. Sean was registered with NCMEC as of June 28th under Suzanne's Law that allows NCMEC to provide additional resources to missing persons 18-21 to include profiling case information on the website at www.missingkids.com, investigative assistance, case analysis, and more. We are extremely thankful to Robert G. Lowery Jr., Senior Executive Director, Missing Children Division for expediting this process.